The Bluetooth Anova Sous Vide Precision Cooker is our highest rated sous vide machine. It had one of the highest quality and durability scores of the 33 different models we reviewed. It has a powerful compact design, Bluetooth Connectivity, and great value pricing that make it a top choice for people looking to get started with Sous Vide immersion cooking. Lower power compared to other models. Power cord is shorter than we would have liked. $129 Current Price - YOU SAVE $24.99. 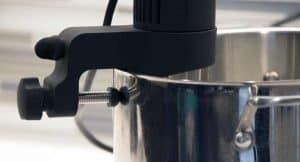 The Bluetooth enabled Anova Sous Vide precision cooker is our favorite sous vide machine, it hits the sweet spot of giving you just the functionality most people are going to need, with a few well thought out design decisions, and at a reasonable price that's in everyone's budget. This is a perfect choice if you're just starting out or are looking to upgrade to something with more features, is a better quality, or want Bluetooth Small Appliance. This model is just shy of 15" high and is just over 2" in diameter, it's on the larger side of all the units we reviewed but it's not the largest. It has good quality stainless steel tube, and the control unit feels very solid. Of all the models we reviewed this was near the top for build quality (Only the Commercial Sous Vide models were higher.). One of our favorite features of the Anova Precision Cooker was the adjustable sliding clamp. The clamp isn't connected to the unit. You attach it to the cooking vessel separately, then slide the cooking sleeve down through the slot adjusting it so it sits as shallow or as deep as you want it in the cooking bath. This is a feature we wish more models had. Our one complaint about the design of this model is the cord, it's a lot shorter than other models, and if you don't have a lot of outlets you may need to use an appliance extension cord. 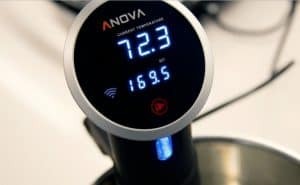 The Bluetooth Anova model puts out 800 Watts, compared to 900 watts for the Anova WiFi Sous Vide and 750 for the Anova Nano. Most of the models we reviewed were in the 1000 watt range with some as high as 1200, this is both good and bad. The lower the wattage the longer it's going to take to bring your cooking liquid up to the desired temperature, so it definitely will take longer to get to the desired temperature. The good part is this reduces the amount of evaporation that's going to occur, so if you're cooking something for a long period of time, you won't need to refill the liquid as often. It's both good and bad and really depends on your cooking style. The water flow for this model is 1.2 GPM which is the lowest of all the units we tested, most models were 1.5 GPM and some were 2 GPM or higher. The lower the GPM the less your cooking liquid circulates and the longer it's going to take to come to temperature. An advantage of having a lower GPM is reduced evaporation. This model has a minimum water level of 2.75â³ and a high water level of 6.25â³, which is a good range and right in the middle of all the units we tested. This was also one of the louder units that we looked at. The controls for this model were pretty easy to understand and read. The unit is turned on and off with a single button located under the LED display. On the black part of the tube is scroll wheel this allows you to easily set the desired temperature up or down. The large display will show the current temperature. The lower display will show the set temperature. While this unit does come with a built-in timer, it's incredibly complicated to set on the actual unit. I'd recommend using a standard kitchen timer, the timer on your phone, or using the app to set the timer. On the face of the digital display is a Bluetooth button for pairing it with your phone. Sometimes this can be a frustrating process, but we were able to pair up right away. Bluetooth only has a range of about 20 feet, so if you walk out of range you may lose the connection. You will need to install the Anova app onto your phone to take advantage of this feature, and the app is available for both Android and the iPhone. Using the app is pretty straightforward you just follow the on-screen menus. The Bluetooth unit did have a much better range than expected, our testing enabled us to control it from anywhere inside the house. This isn't an Internet of Things device. You won't be able to start the sous vide that's in your home from your office. There were some issues requiring you to connect your Facebook profile, and social sharing, but they have been removed from the app, so you can ignore any complaints you might see about that. Overall we felt the Anova Sous Vide Precision Cooker with Bluetooth was our top rated sous vide. It's quality construction combined with good design and ease of use at a reasonable price make it a great choice for almost every kitchen. If the price of this model is out of your budget, consider the Anova Nano Sous Vide for only $97.86 . If you have a slightly higher budget or would prefer WiFi over Bluetooth try the Anova Wifi Sous Vide for $153.33 . 14.8" x 2.8" x 2.8" 11.1" x 14.8" x 4.5" 11" x 1.9" x 1.9"